Lessingham is a small rural village and the Methodist Church is situated near the Ingham/Lessingham boundary. It is a small but vibrant faith community with a broad vision. This vision includes developing our Worship space to increase its versatility and thereby to offer excellent facilities for use in the locality. We have developed the kitchen in order to be able to offer preparation of meals on site. The outreach to the local community will include the development of the Forget Me Not Club for people living with dementia and their carers, which is a facility not provided locally. 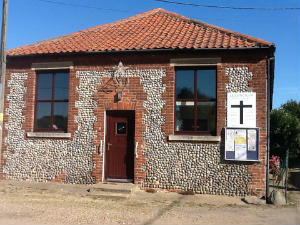 Julian Prayer Meeting – 3rd Wednesday – 1.45 pm - 2.45 pm at “Sweet Briar”, School Road, Lessingham.